Sara Studebaker handing off to me in the Mixed Relay in Presque Isle. 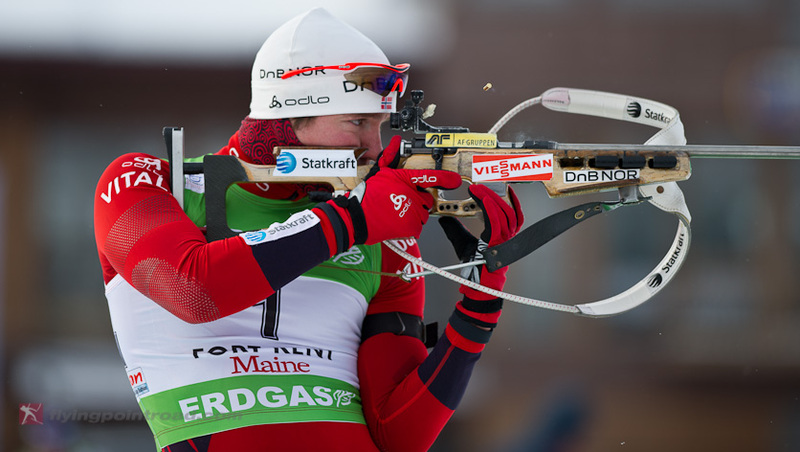 Emil Svendson, bib 1, point 1. An aerial view before the start of the Women's Pursuit race in Fort Kent. 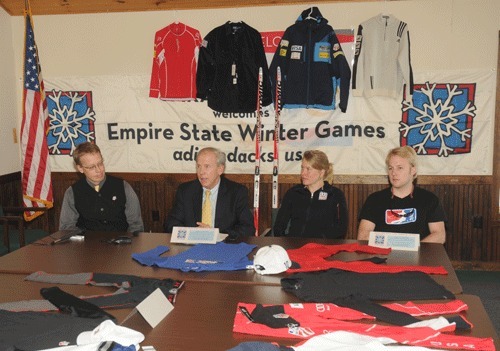 The Empire State Winter Games are able to continue this year because Adirondack communities formed a coalition, drummed up local support, have gathered the needed volunteers and have gotten the region excited about contributing to an important event that means something to New York athletes. Lake Placid will host 13 winter sporting events next weekend for middle school to college age student-athletes. It is unique because these competitions are either the height of a New York athlete's sporting career or they are an important event along the development pipeline for aspiring elite athletes. A couple athletes in particular who were past ESG Champions decided to contribute to the fundraising efforts of the Games by hosting an online auction of ski apparel from local Olympians. Billy Demong, the nordic combined skier, and Kris Cheney-Seymour, my first biathlon coach and Saranac Lake architect, of Demong Designs partnered with John Farra, former Olympian and the US Ski Team, the Olympic Regional Development Authority (ORDA) and the Lake Placid CVB this winter to gather items from Andrew Weibrecht, Tim Burke, Lowell Bailey, John Napier (bobsled) and myself. See the skis in the background of the photo? Those are one of Billy's training skis from a year ago at the Olympics and so far there's one bid on them for $300. 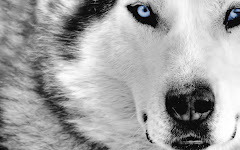 To find out what else is up for auction check out the AUCTION. In this auction created by athletes for athletes 100% of the proceeds go directly to the Empire State Winter Games. "Our community, the Adirondacks and this region that has taken the mantle of the Empire State Games and has kept it going, really speaks to how our region understands and believes in the power of winter sports, the aspirations of children and the hopes to inspire athletes." -Kris Cheney-Seymour, "Olympians doing their part"
Kris Cheney-Seymour, of Demong Designs, Jeff Byrne ORDA, myself and Andrew Weibrecht during Thursday's press conference announcing the opening of the auction. Thanks and congratulations to Aroostook County! I am just back from racing in two Biathlon World Cups in northern Maine with two thoughts in mind: the organizing committees, volunteers and communities did an excellent, world-class job hosting two events and I couldn't ski two lanes down the range or ski the farthest hills of the course without a 'congrats,' 'good luck,' 'go get'em,' or 'go haley!' So I'd like a send an informal but HUGE CONGRATULATIONS and THANK YOU to everyone involved in the Maine World Cups!!! I am grateful to everyone of them. I guess I have a third thought, too: I didn't race as well as I would have liked to in Maine, but regardless our team did great and it was awesome to compete in a World Cup on home snow! Some great volunteers in Fort Kent. The tips of my classic skis peer over the top of 'Soderberg's Summit' and the big climb in Fort Kent. A shot from one of the spectating spots before the Mass Start competitions on Sunday. Beautiful conditions and sunny skies. The first loop during the Men's Mass Start. Lowell, far left, one lap into a career best finish. Marie and Lucien Theriault - two of my favorite people in Fort Kent. I've raced and trained in Fort Kent a lot, and not once without seeing folks like them on the sidelines cheering. Sara Studebaker during her first Mass Start. On the final short, but not sweet, uphill towards the finish area spectators where able to cheer only an arms length away from the competitors. I'm back in Placid for a pre-World Championship training block before leaving for Russia next week. I like Russia's courses, so have spent a good amount of time on Porter Mtn., High Notch and Ladies 5km to benefit from the hilly terrain. I'm not terribly fond of shooting in windy conditions, but Mt. 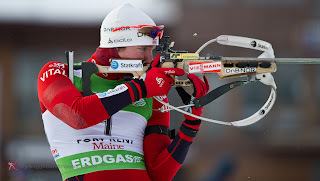 Van Hoevenberg's range is a good place to practice for potential windy conditions on race day in Russia. Plus, the piston bully is back from the dead and I'm looking forward to some good conditions for intervals tomorrow morning. 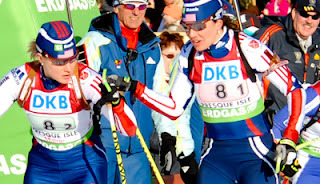 "Rural Maine County Hosts Biathlon World Cup"
I had higher hopes for feeling good today in the Mixed Relay after yesterday's Sprint, but my legs had another idea. 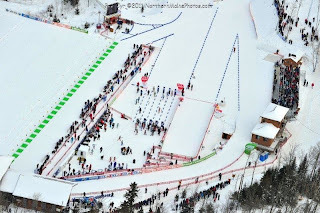 Even though its a short course and a short race, only 6km total and the 2km loop took a little over 5 minutes, I wasn't able to nail down the rhythm in shooting and skiing. Regardless, every race is a challenge and good practice for the next one. Plus, its a Relay and the Team put in a great effort. And to even top that the crowd loudly cheering for the US Team was unparalleled today. Tomorrow's Pursuit will be fun and its a good way finish off the week in Presque Isle. A view of the range, finish area, stands and lodge after zero. The women's field moments after the start. Jeremy anchored the team and brought us back within "flower" contention with Sweden. 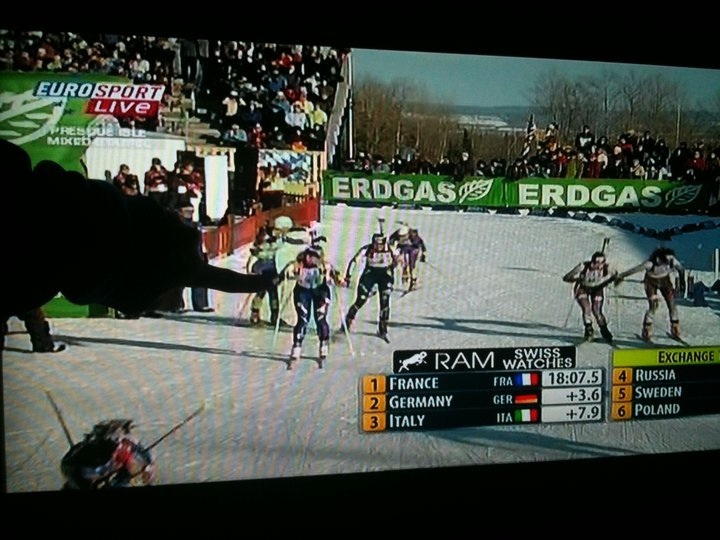 Just got this photo from my aunt in Switzerland where my family was watching the race on Eurosport. That's my cousin Aleksander's hand pointing to me when Sara tagged off. It looks a little sparse from the view, but the vast majority of the crowd crammed on the other side to watch the range, tag zone and finish. Men's and Women's Pursuit races are tomorrow: 10am and 12pm. I'm up in Presque Isle, Maine now for the first week of US World Cups but just came off a good week of training at home. Out of all the places I get to ski around the world Mt. Van Hoevenberg remains to be my favorite. Nowhere has yet to compare to the 15km Porter loop, the heights of High Notch or the terrain of Ladies 5km. If you're in the area, check them out, conditions are great and the local Lake Placid Loppet is this weekend!